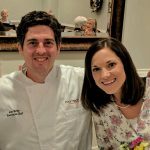 Good Eats: Getting to Know Grace Ridge Executive Chef Jon Kirby - Grace Ridge Retirement Community - Morganton, N.C. 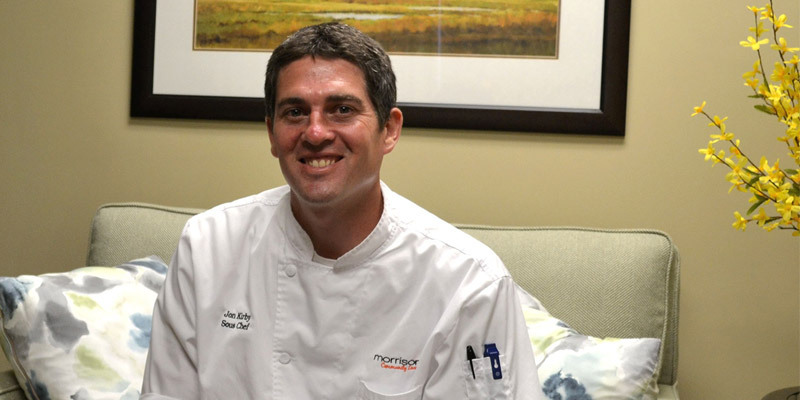 Chef Jon Kirby joined the Grace Ridge family four years ago, when he was hired as a Sous Chef by Morrison Community Living. 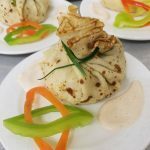 Since being promoted last fall to Executive Chef, Jon has impressed Grace Ridge residents and staff with his culinary creativity (lotus flower root, anyone?) and amiable personality. We sat down with Jon recently to find out what it’s like cooking for 200 residents, where he finds inspiration, what his favorite meal is, and how he spends his free thyme. How did you end up cooking professionally? I first started working in the food service industry when I was 15. Later, I cooked all four years I was in school at Gardner-Webb University. I was still unsure of my career when I went there; I studied sociology and loved learning about different countries and their culture. My passion for culture is what led me to get out and see the world. I found that the best thing about immersing yourself in a new place is the food. After graduation, I moved to Honolulu and cooked at restaurants and cafés and have been working with food ever since. 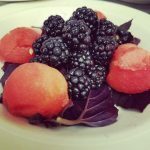 I have always had a love for good food, but I didn’t truly find my passion until I began growing and harvesting fruit and vegetables and bringing them into the kitchen. Where do you find inspiration for the monthly fine dining menus? I like to pull inspiration from my own experiences and travels, as well as what is around me. 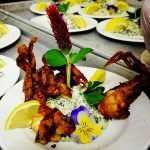 I look at what is locally in season from farmers and my own gardens and build the menu around the best of what is available. I also like to incorporate things I’ve learned over the years. 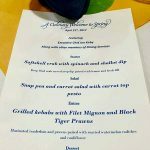 For example, I presented the Japanese fine dining dinner with the entire menu based on items I learned to cook while in Japan. I took a class there through WorldWide Opportunities on Organic Farms on how to make their indigenous buckwheat noodle called “soba,” which I added to the salad course. What’s it like cooking for 200 seniors? I love to hear when people enjoy their meal. We have residents from New England all the way down to Louisiana, so no two residents have the same tastes. I know when planning a menu that some will love the whole menu, while others will be ordering an omelet that day. You get to know many of their preferences and dislikes. Since it’s impossible to please everyone all the time, we seek to please the majority. I especially love speaking with first-time guests who are shocked at the great quality of food we serve for such a reasonable price. How do you keep things tasty and interesting for residents? I challenge myself and the team to go above and beyond in the way we prepare our food. We bread our own chicken, pork chops, shrimp and fish. We make homemade crab cakes instead of buying premade ones. We pick down whole chickens for chicken salad and reserve the bones to make our own stock. Also, with many items that I order, I have the option to choose a local item over a larger brand. I always choose local when given the chance; it’s fresher and helps reduce wasted resources due to shipping farther distances. What has been your most well-received dish at Grace Ridge? Feta and herb-stuffed pork tenderloin wrapped in bacon with a maple bacon cream sauce. It was a dish I created as a special one Sunday that was such a hit I added it to the regular menu. The best meals are the meals of my childhood. When the family all gets back together and my mom makes homemade chicken and dumplings, chicken salad, deviled eggs, green bean casserole and potato casserole. My dad sets his alarm every two hours the night before to baste the turkey that’s smoking outside. And, of course, my grandma’s passed down mint chocolate layered cake. What do you do for fun outside of Grace Ridge? 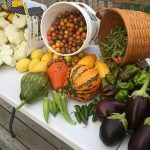 My wife and I live on 8 acres out in the Dysartsville area and run Kirby’s Creek Farm, where we grow food bio-diversely and ecologically. To unwind, I like to tend to my garden and animals. We also like to make fresh meals at home, like salads and smoothies, and enjoy going out to eat and trying new foods. In Morganton, I like Kin2Kin’s beautiful sushi creations and Wisteria for their farm-to-table dishes. What do you enjoy about being Executive Chef at Grace Ridge? What I love most is the feeling of being a part of the residents’ daily lives. I used to always look forward to working Saturday mornings because I knew I could step out of the kitchen and listen to Millie playing piano. I am always happy to hear about their trips and the amazing things they do to stay active, such as Byrd breaking the record for the oldest person to climb the high ropes course at Catawba Meadows Park and ride the zip line at Western Piedmont Community College. I like to think that by providing good, healthy food every day, that I can enrich the lives of each resident. That is much more fulfilling to me than being in a restaurant with ever-changing customers.